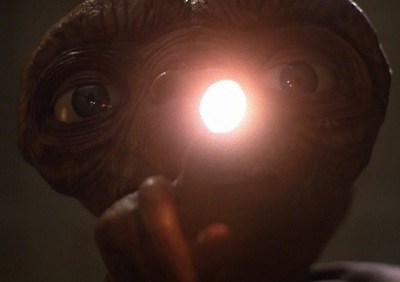 I know it’s a little odd to call one of the highest-grossing films of all time a Forgotten Film Gem, but I have to ask you when was the last time you actually sat down and watched E.T. : The Extra-Terrestrial? For many of us, this film was a key part of our childhoods, along with Star Wars, Back to the Future, and dozens of Disney animated features. But somehow E.T. lost its magic over the years. The 2002 re-release failed to generate much interest from filmgoers, but it did raise some resentment when Steven Spielberg pulled a George Lucas trick and used CGI to add and remove a few minor details. Speaking of Lucas, his original Star Wars trilogy also fell into relative obscurity for a few years in the late-1980s until a slew of novels came out and renewed interest in the classic story of Luke Skywalker. In 1997, Star Wars got a re-release that managed to gross more than $130 million, finally propelling it above E.T.’s total gross from 1982. It’s too bad that modern audiences haven’t been able to connect with E.T. the way they still do with Star Wars or even Indiana Jones. Of course, it didn’t help that E.T.’s re-release was so soon after the September 11, 2001 terrorist attack, so I might be comparing apples to oranges with their 20th anniversaries. I recently watched E.T. for the first time in my adult life, and I’d like to share my thoughts about it and hopefully home in on what it is about this movie that touched the world 30 years ago, but hasn’t managed to have a lasting effect. This film perfectly captures childhood longing, mistakes, innocence, arrogance, wonder, fun, and so much more. It’s amazing the scope of emotions this movie covers while staying grounded with a small group of characters in a tiny geographic location. It tells the story of an alien who is marooned on Earth, and he seeks refuge with a 10-year-old boy named Elliott and his siblings Gertie and Michael. Elliott is extremely protective of E.T., but he’s also still a child who is unprepared to deal with this huge responsibility. At one point, some older kids are teasing Elliott about the “goblin” that he was freaked out by early on, and he finally decides he’s had enough of it when he declares that the goblin was actually a spaceman. And he had just forced his siblings to swear on their lives that they wouldn’t tell anyone else about E.T. What a foolish mistake! But that’s children for you. They’re often contradictory and full of confusing emotions. Gertie’s reaction when doctors zap E.T. – Seeing her jump when she sees E.T.’s body being defibrillated punctuates the scene perfectly. I remember reacting in a similar way when I was a child. Elliott’s anger with the medical staff – He keeps screaming that they’re killing E.T. when they’re actually trying to save his life. I remember when I was a child being afraid of medical staff because they looked so alien with their scrubs, plastic gloves and masks. At one point, Elliott is told that he did the best anyone could possibly do in this situation, and that it’s a good thing that E.T. found him first. I definitely agree on all accounts. E.T. isn’t about extra-terrestrials. The titular character is simply a catalyst for the film’s real focus: children dealing with divorce and facing the prospect of losing their innocence far too early. E.T. is a magical character who heals cuts as a metaphor for healing broken hearts. Spielberg came up with the idea for E.T. while working on Raiders of the Lost Ark, and he had screenwriter Melissa Matheson turn it into a workable script. He wanted to tell the story of his parents’ divorce from a unique perspective. He definitely succeeded. E.T. is an excellent escapist film because it adds something fantastic to everyday life and it gives the audience a lot to think about while they’re having fun. Before Hollywood went crazy with CGI, we had to be content with practical effects like the ones in E.T. I don’t mind at all. The special effects in this film are subtle and add to the story. When E.T. uses his telekinetic powers to make some clay balls move like a miniature version of the solar system, it’s captivating and it doesn’t make me wonder about how it was technically accomplished. In addition, when Elliott flies on his bike, the music and the visuals perfectly mesh so it feels positively epic and triumphant. E.T. himself is a testament to the power of puppetry. His eyes, mouth, neck, hands, and everything else work together to bring him to life. Everything in this film is impressive without calling attention to itself. I didn’t watch E.T. too many times when I was a child because my mom didn’t like all the foul language in it. I never noticed much when I watched it, though. Of course, I’ve never used foul language myself so maybe it just washes off me when I hear it. I paid close attention to the swear words and other derogatory terms used in the film this time around, and I personally think it’s pretty mild. Probably less than the first two Back to the Future films. I counted fewer than a dozen instances. Of course, every time I heard one of the kids use foul language, I was pulled a little out of the film because it felt out of place. But I guess it goes back to the fact that children make mistakes. For the majority of the film, the only adult whose face we see is Elliott’s mother. All the teachers, police officers, scientists, and other adults we see are usually shot at waist level or in a way that keeps their faces shrouded. But all that changes when something significant happens: E.T. is discovered and Elliott is no longer able to protect him. 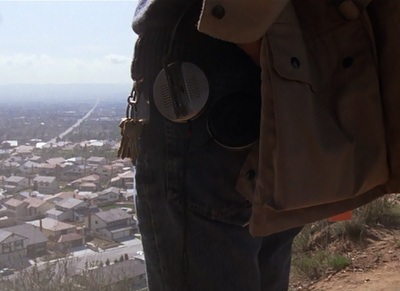 From the very start of the film we’ve seen a man with a large loop of keys on his belt to signify his importance. He’s searching for E.T., and we assume he has malevolent intentions because of the scary music and mystery surrounding him. But when we finally get to see his face and hear him talk to Elliott, we learn that he’s a good man and he isn’t really anything to be afraid of. The moment when the man with the keys finally comes into the limelight and we get a good long look at his face is deeply meaningful, not just in the context of this film, but in Steven Spielberg’s work up to that time. This represented a turning point for his career. Duel, one of his first films, featured a faceless truck driver trying to kill an innocent motorist for no logical reason. The film is a masterpiece of Hitchcockian suspense, and in the end we never get to see the truck driver’s face. We don’t get any absolution because we never discover the motive behind the madness. It’s similar to Jaws in which we rarely get more than a glimpse of the shark until the climax. Even when we do finally get to see it in all its hideous beauty, there’s nothing very deep or fulfilling about it. Sharks eat because their instincts tell them to, nothing more. After E.T., Spielberg almost never used that trick of not showing a character’s face again. The only time I’m aware of is with the pickpocket in The Adventures of Tintin (2011). This might seem like a trivial thing, but I feel like it’s very important. Spielberg is a role model for J.J. Abrams, who loves to include important details in his films/TV series that mainly go unexplained, such as the MacGuffin in Mission Impossible III, the little cubes in Super 8, red matter in Star Trek (2009), and pretty much everything in Lost. I like the fact that he does that because it’s sort of refreshing to have a few loose ends at the end of a film. Spielberg lost his ability to both satisfy and tantalize audiences after E.T. That’s not exactly a bad thing because it does show his ability to mature as a filmmaker. It’s just sad to see the end of something great like that. That’s right, I’m saying that the goodbye scene at the end of E.T. is better than any other, even the one in Casablanca. We’ve known that this is coming for pretty much the whole film. E.T. wants to get home, and Elliott can’t come with him. But nothing can prepare us for when the moment finally arrives. E.T. gives some beautiful advice to Gertie with the simple but heartfelt “Be good.” He reacts timidly to Michael’s unexpected touch. And he saves the best for last. He wishes Elliott could come with him, and Elliott wishes E.T. could stay. Seeing them express their wishes through simple words and tearful embraces is enough to melt any heart. And for some inexpressible reason, the rainbow the spacecraft leaves as it heads home across the late-afternoon sky is so comforting and right. It’s the perfect final touch. How did the filmmakers manage to get so many perfect performances from child actors? The reason the goodbye scene is so memorable is because all three child actors are acting their little hearts out. The movie was filmed in sequential order so that the children could understand everything they’re supposed to be feeling in each scene. So after all the emotional ups and downs of filming all the scenes leading up to the climax, they were primed to give the performances of a lifetime. Henry Thomas and Drew Barrymore, especially, deserve a lot of credit for carrying this film. Thomas is always doing, saying or reacting to things the way the audience would in his shoes. Barrymore adds hilarious and surprisingly thought-provoking touches every scene she’s in, like when she notes that she doesn’t like E.T.’s feet during a dramatic scene, or when she teaches E.T. how to speak and dress. 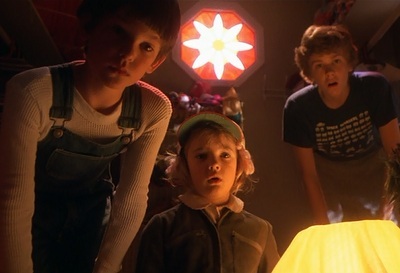 Spielberg pulled off a miracle getting the Dream Team of child actors for this film. I suppose the reason why Star Wars is still beloved while E.T. has been forgotten is that Star Wars speaks to people across cultures and generations. E.T. is a product of the 1980s, with its references to Dungeons and Dragons and other things that were part of popular culture at the time. That’s one of the great things about setting your story in another world or a faraway time period, like The Lord of the Rings or Star Trek – it’s easier to make timeless films that can stand the test of time. E.T. is a wonderful film, and I still think its message is powerful, but it’s also a little dated. As E.T. himself says at the end of the film, he’ll always “be right here” waiting for us to rediscover him when we sit down and watch his film. He’s definitely worth it. All images from E.T. : The Extra-Terrestrial are the copyright of Universal Pictures. This entry was posted in Forgotten Film Gems and tagged alien, et the extra terrestrial, films, movie review, movies, science fiction, star wars, steven spielberg. Bookmark the permalink.